The Kawasaki Ninja 300 has been the most popular road bike in the country for the last three years. We did a little bit of digging through the Cycle Torque archive and it turns out we haven’t ridden one since then. For this test, we thought a little bit differently and put it through it’s paces both on the road and at the track to find out just how capable it is. To me the figures don’t lie even though most punters say being a LAMS bike its popularity is misrepresented. A large percentage of Ninja 300 owners are certainly learner riders either buying their first bike, or their first new bike which is partly why it is so popular. 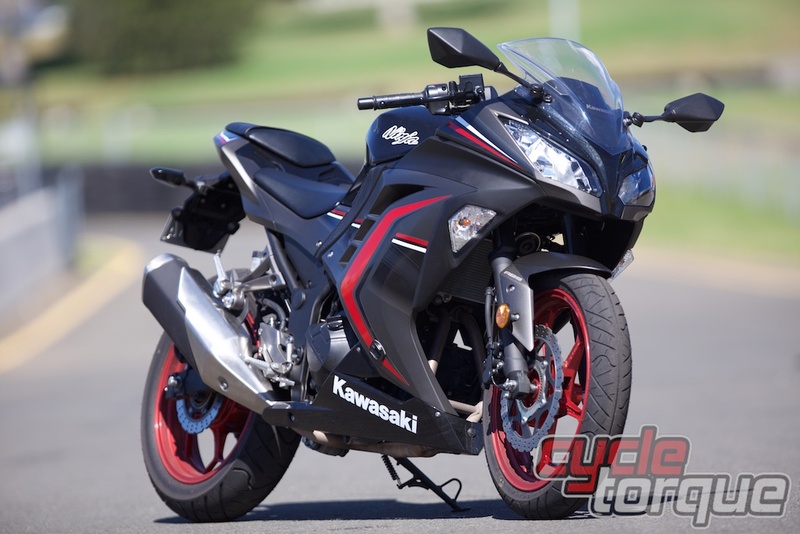 Most states require learners to hold their licence for over three years, so to stay at the top of sales charts for that long means Ninja 300 riders are holding onto their bikes longer than other LAMS bikes and I’ll tell you why. The Ninja 300 has a solid set features that set it apart from other bikes in the category. First and foremost is the bike is available with ABS. More and more of the bikes in the 300-650 segment are starting to come with ABS now which is great, but there are still a few that aren’t. There’s also a slipper clutch. I get why it’s used and you will find that part out later, but at the same time, on a bike aimed primarily at learners, I don’t. On the road under normal riding conditions, you know – not revving up near the redline, a slipper clutch will only really save your bacon if you change from third to first too soon, which would be a pretty rare occurrence – even for learners. In its defence, it does make the bike much easier to ride, but clutch control is an important skill and I will also address that later. Other features of note include the radiator fan blows hot air downwards – on a hot summer’s day, hearing the radiator fan click on doesn’t incite profanity and a torrent of sweat. There’s a 17-litre tank, which for a frugal bike like this is huge and makes for a long time between drinks. Partial rubber mounts on the engine smooth vibrations and there is a dual storage compartment under the seat for your wallet or any other small objects. They might not seem like much, but all up they each add a little bit more comfort to the rider and makes concentrating and enjoying the ride much easier. I haven’t even mentioned how stylish the bike is – the ‘Special Edition’ we picked up from Kawasaki Australia is a real head-turner with its metallic flat grey, black and red bodywork and those red 10 spoke wheels are eye-popingly gorgeous. The Ninja 300 is certainly confidence inspiring on the road. The liquid-cooled 296cc fuel-injected parallel twin engine is predictable, and giving the throttle a good twist isn’t overwhelming, nor is it underwhelming. The bike weighs in at 174 kilograms and is accompanied by a well-balanced rake and trail which means it turns into corners easily, and despite its sporty appearance it doesn’t turn onto its side too quickly. The Ninja is also firmly suspended and provides the rider with a good feel of the surface underneath, soaking up all but the toughest of bumps. The single stopper up front works well on the road and ABS engages without startling in an emergency stop. The slipper clutch feels a little bit vague taking off from a stop and seems like overkill – more for the sake of smoothing out poor technique. The distance from the seat to the ’pegs and ‘bars is limited for a guy my size, and on the road I felt too big for this bike. I’m about 194 centimetres tall and 100 kilos take or take. It’s hardly a problem for the bike, nor is it the bike’s problem. The geometries draw the right lines for comfortable, upright riding thanks to higher ‘bars and a wide angle from the ‘pegs, to the seat and ‘bars. Overall, the bike has an impressive feature list and provides you with plenty of feedback and responds superbly to rider input. That’s why people love the Ninja 300. Now it’s time to push the bike a little bit further at the track.